Valentine’s Day is not about celebrating the love shared between lovers. It’s about all making those you love feel special. And who deserves to be special more than your mom? She is the only lady who can play many roles in your life to make you smile but no one can take the place of her. Your mom is the only friend who always supports and motivates you, whenever you feel yourself down. She acts as a backbone of the family who unites all together in every rough condition of life. Life is full of challenges and she always pushes you to bear it all. On Valentine’s Day, celebrate the love you shared with your mom. She is your lifeline, so she definitely deserves something very extra special. Isn’t it? Valentine’s Day is the perfect time to say thanks and gifts can be the ideal companion to make the expression of your feelings you have in your heart for your mom. But picking the right Valentine’s day gifts for her can be a little tricky. Therefore, we have come up with this article to take you out from the dilemma of what to buy or not. This article helps you to get inspired as here we have found a bunch of beautiful Valentine gifts for any budget. So, just go through this article and buy the best to show your appreciation to your mom in a nice manner. A Necklace: A Gift, i.e., Close to Her Heart! Women love to wear jewelry. So the idea of gifting a necklace is sure to be a hit. Every mom loves even a small gift from her child. This beautiful necklace is something that she will like to have and sure to wear again and again. To make it more endearing, you can also get it customised with initials either her name or yours. She will definitely keep this gift close to her heart. With her hectic schedule, she may not have time to take care of her skin. Your mom’s skincare routine probably consists of just face wash. She deserves a little pampering. All this can be done easily by gifting an excellent skin care facial kit. This gift from your side will help you to rejuvenate your mom’s beautiful face in a nice manner. Your mom does so much for you, so it’s your turn to make her feel special. This is definitely a must-have thing you can gift on Valentine’s Day to your mom. Your mom loves this sentimental stuff. Yes! It is one of the most beautiful gifts you can ever gift to your mom. Get a sentimental message print on your wall and see your mom’s reaction. Hey, this time your mom will not scold you writing on the walls. She will be going to love this. If you are living far from your mom, this gift will always remind her of your love and how you still connected. Valentine Flowers: When You’re Short of Words! When it comes to buying a special Valentine gift for your mother, then you can’t make a choice what to buy or not? That time flowers come to rescue! Flowers are the beautiful creation of God that spread smiles, cheers and happiness all around with its adorable beauty and aromatic fragrance. Buy a lovely bunch of roses online or any other arrangement of flowers and present it to your mom. Wish her a very Happy Valentine’s Day loudly and say thanks to her in a special way. If your mom is a coffee lover, so this mug is perfect to gift on Valentine’s Day. 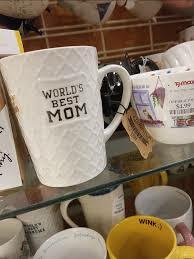 The best part of this mug is the printed words “World’s Best Mom.” These words will make her feel special as well as express your eternal love for your mother. You can also get your mug customized with the words you want to convey. She will love this adorable gift and always think of the moment when you have gifted it to her. Your mom is the best supporter, motivator and a friend who always be with you no matter how the stressful her life is. The above-listed Valentine gifts are perfect to charm your mother and make her feel special.